Southwestern Kodiak Island, includes Karluk Lake and the drainages around the lake. 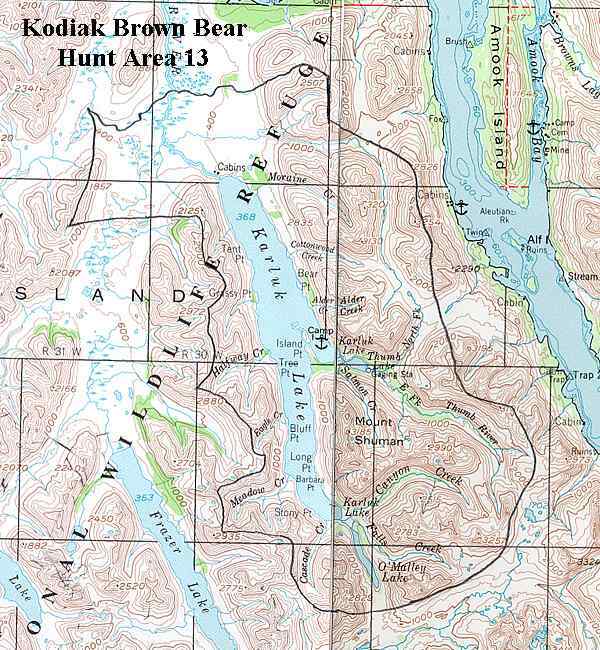 Hunt area also included approximately 3 miles of the upper Karluk River. See area map (Image file 84 kB). Mountainous terrain intersected with numerous drainages, grass and cottonwood flats along the lower elevations with alder and willow thickets extending up to 1500' in elevation around Karluk Lake. Two small lakes, O'Malley and Thumb, are south and southeast of Karluk Lake. Lands south of Thumb Lake are within Kodiak National Wildlife Refuge, with the remainder being Koniag, Inc. lands. Cabins on Camp Island and the outlet may be reserved from Koniag Inc.